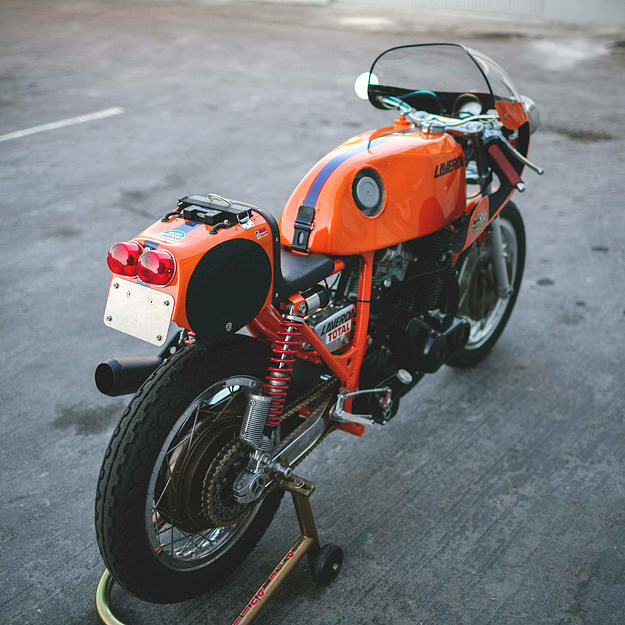 The bike is 1975 Laverda SF2, bizarrely discovered under a pile of clothes by Takashi’s friend Hiro Ishihara. Hiro’s first idea was to transform it into a Laverda SFC, or a cafe racer with clip-ons—but Takashi had other ideas. 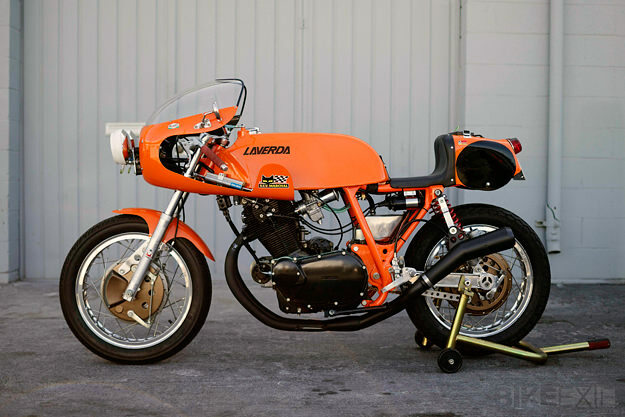 Ah, Laverda. The great, lost name of motorcycling. KTM now has a mortgage on vibrant orange motorcycles, but in the 70s the color was synonymous with the Breganze factory in northern Italy. 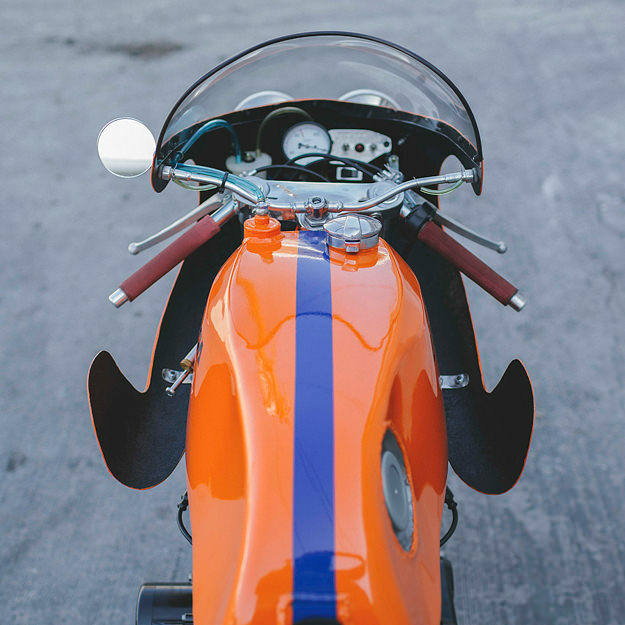 Few builders get the chance to work on Laverdas these days, but Takashi Iwamoto of Cascade Cafe Racer in Hawthorne, California is one of them. And he’s done an amazing job on this machine. While Hiro was scouring the globe for SFC parts, Takashi dug a little deeper into his knowledge of vintage racers. 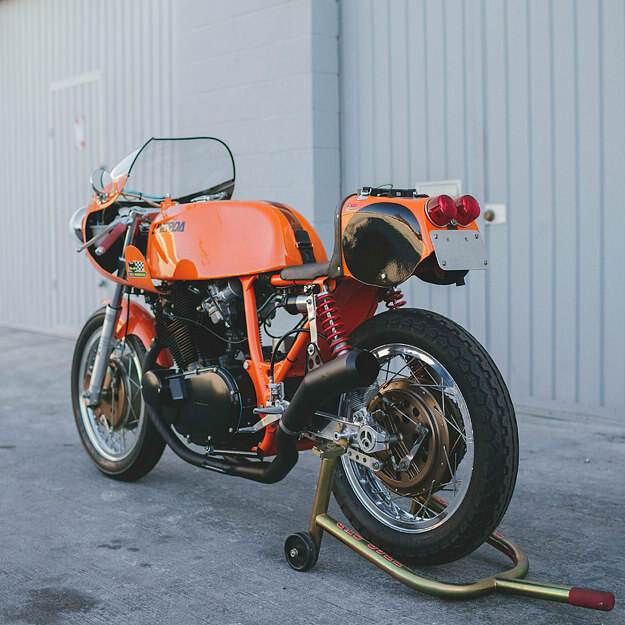 With a little push, he convinced Hiro to embrace an endurance racer concept for the Laverda. This is more than just a specialty for Takashi: He’s spent years researching and building race bikes. It was decided to create something unique, with details reminiscent of the old factory racers. But at the same time, the Laverda had to be street legal. The aluminum gas tank is a piece of art, handcrafted by Takashi with his signature 80s race-style quick filler. The frame was modified to add more of a race stance with chromoly steel tubing. The handmade swingarm was one of the most challenging parts of the build. 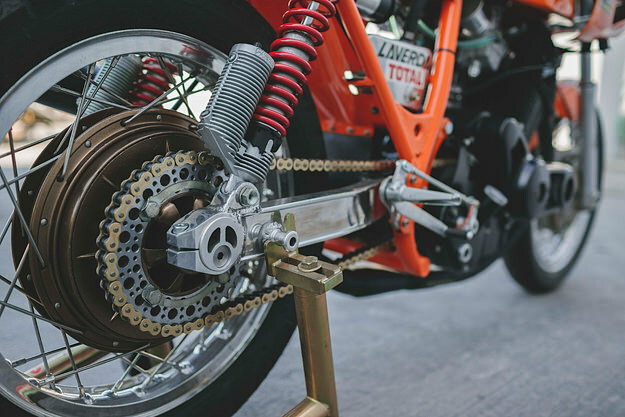 Takashi added an eccentric chain adjuster taken from a Kawasaki GPZ750, and the tailpiece is a modified RCB1000 endurance racer seat unit. The hand and foot controls are one-offs. The engine needed attention too. In five days, Takashi blueprinted and built the motor with 11:1 high compression pistons and race cams. The 750cc motor breathes through two 36mm Dell’Ortos, with gases exiting via a handcrafted exhaust system. It’s almost impossible to list every single detail on this SF2; It took Hiro and Takashi two years to gather the parts and to build all the one-off pieces. The finished product is something you could sit and stare at forever. Well, until that switch is flipped and the Laverda roars to life.